Buonasera! What an absolute clinic that was from Roger as he swept past Potito Starace 6-1 6-2 in just 51 minutes. Tough to put into words how well he played in this one as it was such a fluid performance and Starace didn't even play badly yet he got taken apart. As a fan you couldn't ask for a better response after the tough loss to Nishikori, with a fresh new haircut Fed looked like a new man out there really as pretty much everything he tried came off. Liquid gold forehand folks. How do you analyse a match that lasted 51 minutes and was dominated by the GOAT? It's not easy so in a nutshell it was Federer creaming the ball off both wings and Starace looking slightly confused as to what was happening. It's always a good sign when Roger holds serve easily and a 50 second love hold in the very first game just set the tone for this one. Starace got off to a nice start too holding to love but from there on he wouldn't see the light of day again. At 2-1 Roger created 3 break points, rather than waste them with chip returns, he played aggressively and blazed a forehand into the open court to start with a 100% BP conversion rate. That was consolidated and the double break sealed easily to take a 5-1 lead. In true Roger style he found himself 2 break points down when serving for it but he saved them both and took the set 6-1. Routine. The good thing here was even though he fell 2 break points down, he'd gotten so much confidence from the way he was playing that he could just play like them like he had nothing to lose. That's a big part of his game so it was nice to see. I know it's only the second round and Starace isn't top tier but this was pleasing to see especially as he's been losing to player of a similar calibre to Starace recently like Benneteau and Nishikori (ok they're slightly better). The second set was more of the same and you just knew Roger was going to accelerate away with this one. He broke early was soon into a 3-1 lead with 2 more break points, Starace staved them off but Roger wasn't to be denied as he broke again to lead 5-2 and then served it out hitting a down the T on match point. Very nice, he hardly missed all match and then sealed the deal in style. This was a total treat for the fans and I guess the only disappointment is that it only lasted 51 minutes, but when you see the highlights reel there's plenty of shots that were worth the ticket price alone. I had no choice but to hit the practice courts here… what I've been working on seems like it's working but then again every opponent plays different and today Potito couldn't make an impact with his game and I was able to impose my will today. 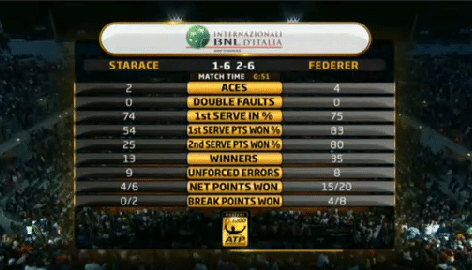 35 winners to 8 unforced errors, and Starace only hit 9 unforced errors himself, shows you the level he was playing at! Whether your a Federer fan or just a tennis purist then it doesn't really get much better than this in terms of aesthetics. Make no doubt about it Roger was in full flow tonight, timing everything, serving bombs and hitting the casing off the ball off both his forehand + backhand and it's just so much more fun to watch. You only have to look at the stats image above to know how solid this match was from Roger, he really came up with the goods tonight and just made Starace look like an amateur. I'm trying to pick out specific shots but pretty much every single time he hit a forehand it had some serious zip on it, even the backhand was firing winners from all over the shop. The main thing this all stems from is great footwork and movement, it looked like Roger made a real effort to be on his toes tonight and constantly on the move. This is really the key to top level tennis, if you're stood still for even just a split second then you're going to struggle. Testament to the focus on movement is that he played 20 points at the net and won 15 of them, in a match that was only 15 games long and on clay that's a really high number which is great to see. There's not much else you can say really other than I hope he continues where he left off in the next round. It's important he capitalises on this purple patch he seems to have entered and tries to maintain it. I don't think he can play like this every single match in a tournament but keeping above a certain level throughout and playing clutch when he needs to is the goal from here on in. Tonight was a statement match in my mind, a few tough losses and he hits back with a great win and it's the best I've seen him play probably since the Raonic match at the Australian Open. I suppose it's important not to get too carried away off the back of one performance but with the draw opening up after Haas and Dimitrov both lost it does look like he can put together a decent run here and get some confidence back into his game for the French Open and the long stretch of tournaments that are head. Next up for Roger is either Gilles Simon or Mikhail Youzhny. When it comes to thee two they're like chalk and cheese for Roger. He struggled against Simon and cruises past Youzhny so it will be interesting to see who he faces. Simon has a winning record against Roger and the last time they played was in that 5 set epic at the Australian Open in 2011. Simon has been ok form pushing (literally) Murray hard in Madrid but I think Roger can beat him here in Rome if plays aggressively and comes into the net a lot like today. It's tough to see why Roger struggles against Simon really as he's such a lightweight but he does move well, strikes the ball cleanly and gets a lot back in play so I guess that's why he comes unstuck. As for Youzhny he's pretty much Roger's whipping boy as he leads him 14-0 in the H2H. I suppose you could say he's due a win against him but I don't think it will be here. Youzhny is almost like a lesser version of Roger in his style, a nice game but one that breaks down very easily and he can self destruct at any given moment. I think he will play Youzhny next but from a personal point of view I'd prefer Simon as I think beating Simon here is a good test and will give him more confidence for the later rounds. Either way I'm picking Fed in straights: 6-4 6-2. Allez! The grass court season is about the time I start commenting on my own posts letting myself know what an excellent job I’m doing. now onto the real comment: what impressed me the most was his return… He was hitting a flat return from his backhand, which landed deep into the other court, didn’t see him chip many, which is always good to see. Seems like the ball was in slow mo for him, didn’t miss it at all! And that backhand was REALLY impressive! Well observed. That was the mst satisfying thing about this match. Aggressive returning and deep to the baseline. No chipping! Also quite a few serve volleys, he did hv more energy, and cut out those errors! Wld just love him to make the final! Yeah he returned really well, even hit some clean winners off the backhand side which was good to see. A really nice match and a nice read too Jonathan 🙂 I had a secret feeling since i saw the draw that Roger is going to win Rome for the first time and if he keeps this level i think it won’t be much of a fantasy, will it? One last thing, Simon is tied with Roger at 2-2 after he was leading by 2-0. Yeah I realised 2-2, but in their last match he retired injured so not really one you can read too much into. Lve the short hair too! Yeah more streamlined. Clearly why he’s moving better. Couldn’t see the match (will watch it tomorrow) but very very happy to read of course the score line but even more pleased and happy to read the things on my TL/Twitter and here! Thanks for writing that up so quickly! It gave me such a good impression what kind of match I’ll be seeing tomorrow morning 🙂 So more of my comments later I think! You will enjoy it. Was great to watch! Wow, that was impressive, Roger at his best! He should save some for the final! Great new look too, a perfect performance all round! Yeah very nice match! Allez. For Jonathan.. Thanks for ur analysis as i couldnt watch bcos i was working. It seems Roger is back and i hope he can take this form deep into the competition!! Would b fanstastic if he could win especially with his last performance that were well under his standard of play. Again good post, hope fed does what he is known for??!!! Come Roger!! Cheers man. Check the highlights on YouTube, you won’t regret it. This is the 1001th reason I believe Roger tanked his Madrid match. Yep that’s the one I picked in the video I just added. Such a sick backhand and he was moving great. @Simon: I think he is a weak version of Murray. A good clean counter puncher without the strong first serve and return of Murray. Well clay hasn’t been Simon’s best surface. Taking the ball early and using the speed of your opponent’s shoots work better on hard court (as we can see by Murray’s clay court performance :)). Anyways I think Youzhny will win as he beat Haas earlier. Yeah pretty good comparison I think. Simon hits very clean and can hustle, guess that’s why Fed struggles. Youzhny might be finding some form, think he did ok in Madrid too. Hope so Carlos. I’m not getting carried away, as usual fans are making him a lock for the title despite him not winning one since Cincinnati! Well. Jonathan thinks anyone who Federer is tied with is ahead in the head to head! 😉 lol! How far do you see Roger going in Rome? I see Roger wearing the laurel wreath come Sunday! A default though so not truly indicative of the H2H. Obviously counts but in completed matches Simon leads 2-1. Will be interesting. Finally Rogi showed us his true class and full repertoire of mind blowing killers shots! His opponents,no matter who, wont have easy life in Rome. He did, some of the drop shots were crazy good. Starace had no chance. Looks like Roger has shaken off his hangover. At least he is playing with conviction and aggressive in his return game. Simon will be a tough test for Roger, hope he can pass with flying colors. Yeah nice to see him turn it on. I think some people thought he was declining but I knew it was all mental nothing to do with ability. Still, early days in the tournament, we need to see a mediocre performance where he still pulls out the win, those give him most confidence. Yeah, that’s a trend with him nowadays a few good performances and 1 horrible shankfest that we will cringe and howl over it. Btw he looks adorable with his new haircut, almost like schoolboy really. Nike ad is cute as well, Roger swatting a fly – hilarious really. Thanks for the match report. You sound stoked, Jonathan. Losing in Madrid, I think, was a blessing in disguise. Hopefully, it “woke” Fed up….the sleeping giant. I hate the hair cut. The longer the better for me. Hair is cool I think, he’s moving better, clearly the reason. Correction: last time Fed played Simon was Miami 2011, but Gilles retired 3 games in. Yeah just seen forgot about that. Would be interesting to see if it had been a full match whether it was 2-2 or 3-1 Simon. Well Fed had back pain in Shanghai 2008, he could have retired, but of course he didn’t! Such an amazing performance! Just what he needed after Madrid. Granted Starace is not exactly a top player, but Roger was just wow! I’m not suddenly expecting him to win the title now though. One round at a time! BTW, I DEMAND the curls back. Yeah Starace isn’t a world beater, but he’s former top 30, in front his home crowd and he played pretty well. Just Roger schooled him. A good match up for him for sure but he turned it on. The curls are gone for now, forget it! Me too! Miss that hair flying when he flies! Best match Roger has played since Australian Open hands down. It’s so fun watching him play like this. THIS is the response I like to see from him, but as you said we can’t get carried away. Saw the same thing in Indian Wells with Istomin but the back was the problem there so I’m not sure what to expect but this is encouraging for sure to see some desire that has been lacking. Statement win is an understatement Jonathan, he’s out for blood. Indeed, last time he was zoning in was against Raonic I think. Hope it continues. Allez les suisse! Fed’s haircut reminds me of Del Potro. lol. Looks interesting. Although he played really well, I’m still not convinced he’ll get far into this tournament. Is it just me being skeptical? I want him to go up against at least one of the Big Four so he can have a better feel for Roland Garros. It feels like it’s been a long time since he went up against them. It’s as if someone mixed up Fed’s clippers with Del Potro’s. Or maybe the twins were playing with scissors and got a little too close. Starace not a nobody though, top 30 and a clay court specialist. Granted Fed should be whooping him and he did just that. Federer will face Simon tomorrow and its the matchup that i have been waiting for since 2 years.Federer should try and beat Simon in his own game and engage in long rallies rather than pulling the trigger early if he wants to beat him.Murray has retired so Federer’s path to the final has become much easier.If he gets past Simon he should get through to the final unless Del Potro has other plans which i doubt considering he’s just come back from a flu(i think? 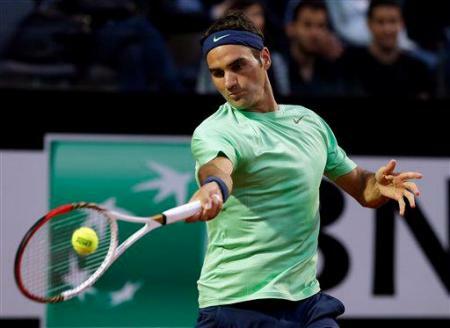 ).Everything seems to be falling in place for Federer to finally conquer the Foro Italico. Beating Simon at his own game and engaging in long rallies would be a disaster strategy Arun. When has getting into baseline wars ever worked for him? If he does that he will lose. The play is to be aggressive and finish points at the net. Simon can retrieve well so Roger has to work him over and pull the trigger when he gets the chance. Any sort of short ball and he has to step in and dictate. Finish points in the forecourt. Can’t afford to be passive here. Agree, all out aggression, and lots of serve, volley Plse! Things hv got interesting with Murray out. Top 4 having interesting season so far. Far more upsets as the 2nd tier gradually get their act together. Things moved in Feds favour today in terms of the WTF Race. Almagro, tsonga, Wawrinka, Nishikori all out. Just need Gasquet to lose now for Fed to start a push up the places! If he comes thru Simon, I see him all the way to final! Come on Fed! Hv a good feeling! Simon shld be pretty tired, has played a lot of games recently! Take advantage Roger of yr draw! May not happen again soon ! So Simon it is then, he’s been in poor form lately so Fed should be able to get the job done but then again he is one of the strange players that has some sort of hold on Roger. BTW Guys, you should really check this out…incredible. Murray best one, but he’s the easiest to do. His Rafa was pretty good I thought. He got the no? and the deceptive humble nature spot on. Yeah not bad, people going crazy over it though. Djoker’s impressions are far better. Jonathan are the rumours true, I heard Roger is doing another round of exhibition matches in December this year back in South America. I guess this is his new prep for Aus open! Yeah I thought Murray would put in a good performance in at least one tournament but he’s a complete fail on clay. I think he will play the French though. Not heard about Federer doing a new tour, where you seen the rumours? Over trains on the hard courts, clearly has a dodgy disk which then gets aggravated with the huge power he has to generate on the slower court with the additional movement. His body type, heavy, tall, explosive, is not ideal for clay( bit like Tsonga). Reckon he might need an op eventually, real shame. To be fair, Sampras never got it right on the dirt, but you can’t really argue his credentials to be number one. Looks like Murray is pulling off a Lendl. The other way round, though. He said its unlikely that he’ll play RG. Or maybe he really is injured? If yes, then too bad. Never like it when players have to away because of injuries (REAL injuries, that is). Also, I have a bad feeling about the Wimbly. Murray gonna take it this year? :/ No logical reasoning whatsoever, just a felling. Anyway, Wimbly is too far away right now. Saw the match this morning. And was definitely impressed. He looked sharp, focused and intense in almost every point. Definitely making a statement with that match. And yes, it’s not one of the top guys I know that. But it does give me a lot of hope, cause I thought yesterday he was definitely ‘feeling it’ more than before and he def raised his level of intensity because he sorted out his head so that wasn’t in the way anymore. 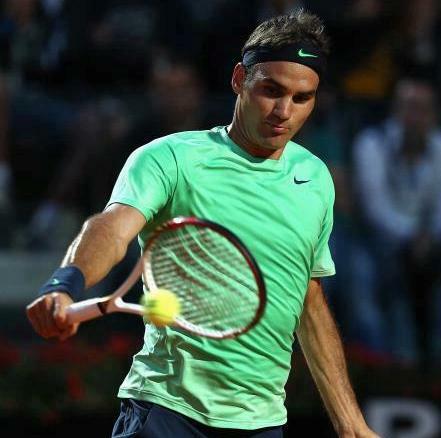 Paul A tweeted yesterday saying: Nice start in Rome for RF tonight – great.execution and mentality – terrific 2 see- Which to me referred exactly to what didn’t go well before. Those were/are def the points they have been working on, also judging from a few practice vids that are out there. Haven’t seen him hit the ball like that in a long time and that got transferrerd into the match yesterday I think. Simon next. Unfortunately, but if Rog stays in the zone and doesn’t let Simon in his head, I don’t see why he couldn’t get the job done. Allez! It was good that’s for sure. I’ve rewatched highlights a couple of times. Didn’t see Annacones tweet. Glad he’s happy. I think he will get past Simon. Allez! So do I but he needs to keep the sharpness and keep UFE’S low. Pity playing so late. Not as gd for Fed as even slower which suits Simon and his endless retrieving. Keep the focus Fed, this cld be yr chance to get momentum ahead if RG!!! Rumours about SA exho’s (Argentina, Columbia, Chile is the plan apparently) were on twitter today. Afterwards also came the information that definite dates will be announched at RG… We’ll see. Ah cool, I don’t mind it this year as there’s no Olympics so less likely to be burnt out at the end of the year. Haha nice analogy. I’m hoping he dismantles Simon too. Allez! PS. I wonder if everytime we mention Simon, Simon thinks we are talking about him?? Has anyone here wondered what Janowicz would do if he wins an ATP1000? Would he do “the full monty”? 🙂 Jeezum Crow! Delpo has clear run to Semis! Did you watch Fiasco vs Ferrer? Fiasco should have won it absolute choke, I’m counting that one as a solid prediction. Starace is ranked 293 not top 30 lol. Fed played well regardless. Important to note Starace beat Stepanek who Fed beat last week in Madrid, so he wasn’t in that bad form. And he played well overall but of course when you have no weapons you are vulnerable to getting beat down by Fed. Overall though, when Fed is in the mood to end things quickly, he doesn’t screw around, no matter who is playing. You could sense he wanted to end it fast as he usually doesn’t remain that focused for an entire match in his first match of the week. Simon vs Fed will be interesting but I think Fed will get it done. The two times Fed lost to him were in 2008, once when he was in a bad slump and the other when he had serious back problems. The first two sets of the AO were glorious. If Fed serves well, remains aggressive, and gets to net a lot, Gilles should have a hard time doing damage. I think so too, Kyle. It is not very often that you see Fed’s full repertoire on display this early in a tournament. He tried a large variety of shots and approached the net every chance he got (although he fumbled two drop shots). I was worried for a while if he had to step up his game that much to beat a wildcard but then arrived at the same conclusion as you did. That he was eager to end things quickly and make a statement of sorts. Woah!! Check out Gulbis 😀 😀 one more set, come on! Mugbis. His forehand is a joke. Should have won that. It’s a pity Gulbis couldn’t pull off the win against Nadal today. He looked like a lesser version of Novak. But again it was Nadal with his loopy negative play point after point to the backhand that won him the latter two sets. It’s really no fun watching his matches. That’s a prime factor which I feel sets Federer apart from Nadal- Federer plays to his own strengths, whereas Rafa plays to an opponent’s weakness. I agree Gulbis is very interesting to watch. Reminded me of Lucas Rosol or Soderling whacking Nadull all over the court. I’m not too big a fan of Jancowicz though. A bit too raw and dramatic for my liking. Hopefully Rog will put him in his place tomorrow. Yeah, I’ve assess Janowicz in my Simon post just now! That’s been the hallmark of Nadal’s game. All he needs to know is just one weakness in his opponents game. As Brad Gilbert would call it, “Winning Ugly”. It’s a fair strategy but definitely makes watching him play very boring. If Nadal can get through Djokovic, a match that for all intents and purposes is the final, he will win win the title, deservedly. Gulbis forehand is ridiculous. If he tightens up that shot he will be a better player. Also not mentally tough enough. Nadal should have lost that really, poor from Gulbis. I just hope that Berdych doesn’t spoil the party by knocking Novak out, because Ferrer sure as hell ain’t beating Nadal. Berdych can’t beat Djoker. Will get owned. I so wish you were right Jonathan. Because I would have loveed to see Nole school Nadal tomorrow. Now all we’ll see is Berdych choking as usual against Nadal. Federer should sail into the final, I’m assuming. Gulbis hammering down forehands with Nadal chasing them from side to side was so reminiscent of the Nadal – Del Potro semi from the 2009 US Open. Gulbis has an outrageously strong forehand and it didn’t look like he was playing on clay at all. Pity that Nadal could wear him down bit by bit as he’s done to so many others. That ‘winning ugly’ and ‘weakness exploitation’ is such a spot on assessment of Nadal’s game. Gulbis’s forehand is a joke. Big big weakness. Wow Federer has beat Simon with a convincing straight sets whooping on Feds worst surface!! I hope he maintains this and gets stronger for the later rounds. Go on Roger i believe in you!!! Me too! Has to make the final! Has to school Jerzy who is slightly disrespectful to his oppo on court! Come on Roger! Huge oppo to get match winning momentum Pre RG!! !no Nadal, no Delpo! Jerzy, then Paire I predict, and I think Novak will beat Rafa if Rafa plays like he did today! Yeah, complete masterclass. What a treat! And in today’s peRFect news: Federer just wrapped up his quick and mostly very clean match with Gilles. In an otherwise solid game, those odd weak moments in some of his service games bother me since this is how he ends up getting broken inspite of being such a fabulous server. Janowicz is next. I was really rooting for E Gulbis after seeing the first set scoreline. Typical Nadal. One of these days Gulbis will get the better of Nadal, if he could improve which he will Gulbis could start to threat the top players more. Just not mentally tough enough. I’m not wild about the hair, I prefer the curls. I actually thought, when he had a haircut before a couple of recent US Opens (ahem), that it was a problem for him. Not because of the hair itself, but because when it’s short he doesn’t smooth it behind his ears. Smoothing behind the ears is tracing the “triple warmer” meridian backwards (this is body energy stuff) and is self-soothing. Helps disperse excess adrenaline in tense moments (in later rounds) – and he’s not even thinking about it, he’s just doing it. Okay, so that’s a little “out there” as theories go. Interesting on the body energy thing. Nadal does that every point.